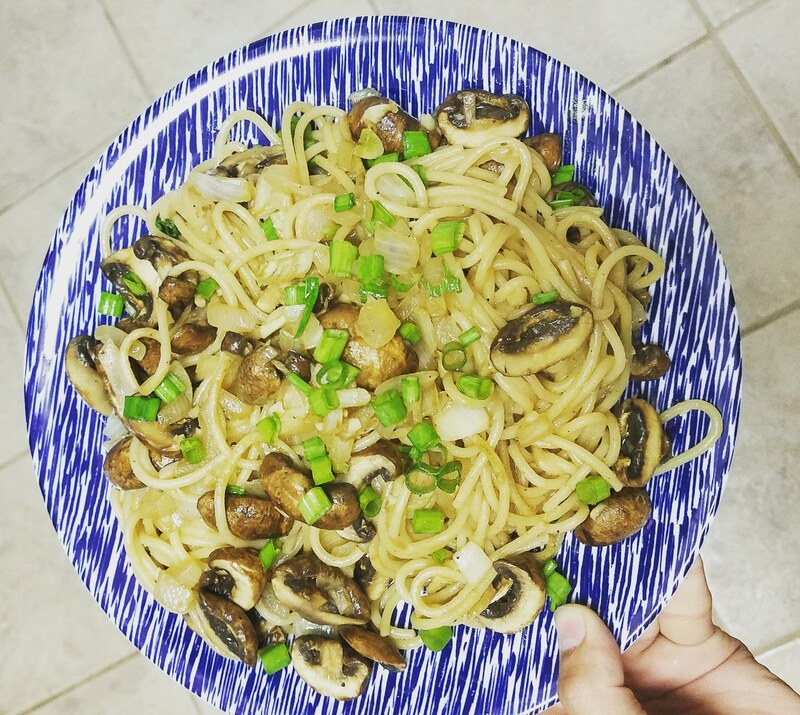 So really this is my attempt at making vegan stroganoff and I am not really sure what I made but it was pretty delicious so I just wanted to share it with the internet. I kind of like to improvise with what I have on hand and I usually have mushrooms, garlic and onions so I decided to take a stab at something different. As it turns out, it tastes good and doesn’t look too shabby either. Normally when I put peanut butter in noodles, I just have a mixture of sesame oil, soy sauce and peanut butter and just mix in brown rice noodles. Today I wanted it to look more professional than the average student diet so I embellished a little. I usually start by boiling the water for the pasta and cooking the pasta. While that is cooking I dig out my saute pan and pour the olive oil on it. When it’s a little warm, I put the garlic and onions in the pan. On medium high heat. I let that sit for a minute and then add the mushrooms. This is when I add the vegetable broth, soy sauce and peanut butter. Stir liberally for 2 minutes and hopefully your pasta is done cooking. Put the pasta in the saute pan with the rest of your contents and stir. Let sit for 3 minutes or so. Now I would chop the green onions and sprinkle on top. Add salt/pepper to taste and there you go a delicious pasta dish with easy ingredients. Hope you enjoyed reading and potentially eating! Comment below to let me know if you enjoyed it!